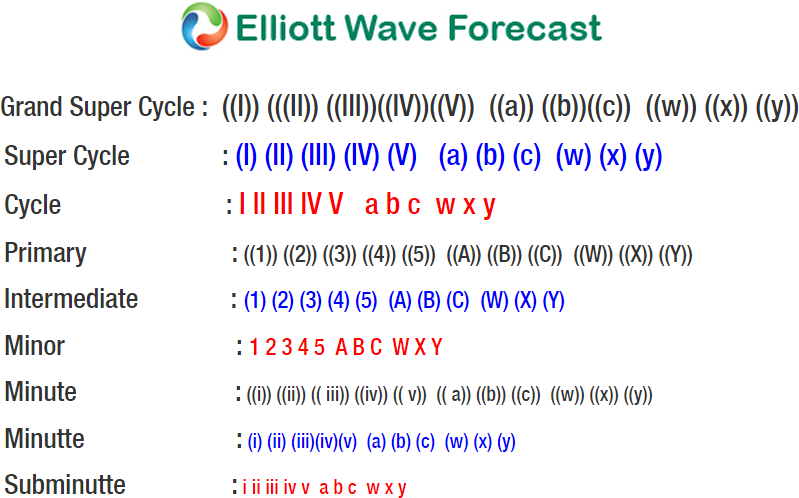 OIL Elliott wave analysis suggests that a decline from October 3, 2018 peak ($76.9) is unfolding as impulse Elliott wave structure. Down from $76.9 peak, the primary wave ((1)) ended at $68.47 low. A primary wave ((2)) bounce ended at $69.65 high. Then a decline to $54.75 low ended primary wave ((3)). Primary wave ((4)) bounce ended at $57.98 high. Oil is currently in the final leg Primary wave ((5)) lower, which also looks to be unfolding as impulsive structure. Down from $57.98 high, the initial decline to $50.08 low ended intermediate wave (1) in 5 waves. 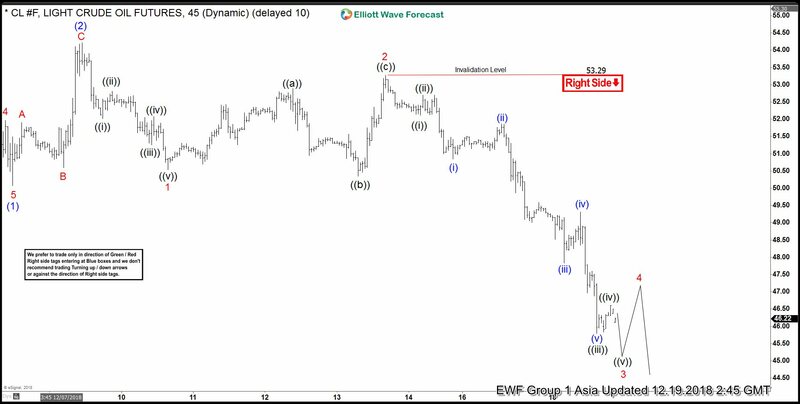 Above from there, a 3 wave bounce to $54.22 high ended intermediate wave (2) as zigzag structure. Below from there, intermediate wave (3) remain in progress in another 5 waves structure where Minor wave 1 ended in 5 waves at $50.53 low. A bounce to $53.29 high ended Minor wave 2 as a Flat correction. Currently, Minor wave 3 remain in progress looking to extend lower 1 more time at least towards $45.57-$45.24 inverse 123.6%-161.8% Fibonacci extension area of lesser degree Minute wave ((iv)). Afterward, OIL is expected to do a bounce in Minor wave 4 in 3, 7 or 11 swings against $53.29 peak before further downside is seen. We expect bounces to get failed against $53.29 peak in 3, 7 or 11 swings for more downside.